QuickFix 6.2 is guaranteed to pass a lab screening. It is a clean, fresh synthetic urine that is free from toxins, and it has all the same characteristics of real urine. 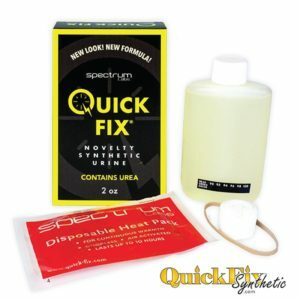 QuickFix 6.2 is a high-end brand from Spectrum Labs, one of the leading manufacturers of synthetic urine in the United States. This artificial urine is manufactured in a controlled environment and with the latest advancements in technology. The product offers a wide range of unique benefits to make preparation and use easier. QuickFix 6.2 is a fool-proof product to pass your urine test, if you successfully submitted your sample to the facility. Quick Fix Synthetic Urine is an authorized dealer, and we can specialize in providing our clients with discreet packaging and billing service. A significant benefit of QuickFix 6.2 is that it has little to no storage requirements. Unlike other fake products on the market, it has a long shelf life of two years. You don’t have to freeze the liquid or store it in a refrigerator, and you can reheat and cool it down several times without compromising the chemical structure or shelf life of the fluid. If you purchase the ten-pack 2 oz bottles, you can store it at room temperature in a drawer, cupboard, or bag for unscheduled tests. QuickFix 6.2 is one of the only synthetic urine brands that keeps its authenticity over long periods. If you don’t want to spend a lot of time taking care of your samples, this is the product for you. We provide discreet shipping and billing to our clients. You will receive your order in a box with a shipping label with the words “CA LOGISTICS.” The charge on your billing statement will read “QUICK FIX LLC” so others will not be able to know the contents of your order. If you place an order via phone or our website, we will send you a receipt and a tracking number. We offer P.O. Box delivery, shipping to a FedEx office near you, or we can hold your order for pick up at a United States postal center. We release orders for transit three times a day from Mondays to Fridays to ensure that you receive your synthetic urine kit as soon as possible. You will have to sign for a rush delivery or order shipped through vendor shippers that exceeds a $100 value.